The outside of the covering leaf is engraved with a circular scale of degrees divided by 10, subdivided by 2, numbered by ten from 0 to 90, with 90 at the top. A square is inscribed in the circle, and the top half is subdivided into 36 squares, marked 4 and 8, and the bottom half is a double shadow square, marked 'VMBRA RECTA' and 'VMBRA VERSA' twice. The shadow square is divided by two and numbered from 0 to 12 by 4. Inside the shadow square is the signature 'THOBIAS VOLCHKMER BRAVNSWEIGSENSIS FACIEBAT ANNO CHX 1588'. In the spandrels space is a decoration of strapwork and fruits. The inside of the lid has a horizontal dial with triangular solid gnomon. The gnomon is in silver and brass, decorated with strapwork and can be adjusted for the marked latitudes 45?, 48? and 51?. The hour lines are engraved on three concentric circles, alternating silver and brass, and the hour lines are engraved for the southern hemisphere from 5 to 12 to 7, and for the latitudes 45?, 48? and 51?. Hours are marked to the quarter hour with alternate shading. The space inside the hour lines and in the spandrels is filled with fruit decoration. This side of the main box has a compass, with the cardinal points marked 'SE', 'OR', 'ME', 'OC'. The names of the eight main directions are engraved in German around the compass. A new compass glass was fitted in 1934. A silver ring with index (not rotating) is fixed to the compass plate. Surrounding the compass is a silver band engraved with a scale, divided to the half (hour), numbered 1 to 12 twice, then with a scale numbered 1 to 24 and divided to the half-hour. On the limb of the silver plate is a scale of degrees, divided into quadrants with 0 at the top, divided by ten and subdivided by two, numbered from 0 to 90 by ten. On the plate, between the 1 to 24 scale and the degree scale, are fixed eight pins to aid rotation. The whole plate rotates inside a recess in which is the surrounding brass plate fixed by means of four screws to a silver base and decorated with fruits in the spandrel space. The lower side of the silver base is engraved with four cities and latitudes 'PADVA 44', 'GENVA 44', 'FERRARE 44', 'MANTVA 44'. The reverse of the rotating silver plate is engraved with 30 cities and latitudes, engraved on five concentric rings. The first ring has 'PADVA 44', 'VENEDIG 45', 'VILACH 45', 'IVDENBVRG 46', 'BRIXEN 46', 'GRETZ 47', 'INSPRUCK 47', 'SALTZBVRG 48'. The second ring has 'WIEN 48', 'BASEL 48', 'PARIS 48', 'MVNCHEN 48', 'LINTZ 48', 'FRIBVRG 48', 'AVGSPVRG 48'. The third ring has 'VLMITZ 49', 'HAYDELBERG 50', 'CREMS 48', 'REGENSPVRG 49', 'SPEYR 49', 'NVRNBERG 49'. The fourth ring has 'MARTBVRG 51', 'LEIPZG 51', 'PRAG 50', 'CRACAW 50', 'DRESDEN 51'. The fifth and last ring has 'BRANDENBVRG 52', 'ANDORFF 51', 'MAGDEBVRG 52', 'BRAVNSWEIG 52'. 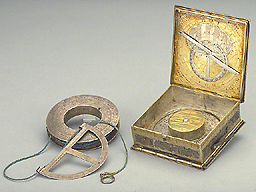 The lower part of the compass case, in gilt brass, is engraved with an outline of the polar circles, the tropic lines, the equator and the ecliptic with the symbols of the zodiac signs. Inside the case is a silver thread reel, with four threads of different colour (red, white, green and blue) wound on it. One of the sides of the thread reel is engraved with a zodiac and calendar scale. On the rim is the calendar scale, divided by ten days, subdivided by two, numbered by ten from 10 to 30 or 31 or 28 as appropriate. The names of the months in Latin are written on a concentric inner circle. The following circle is engraved with a scale of degrees, divided by 10, subdivided by two, numbered by ten from 10 to 30. On a further inner circle are engraved the zodiac sign names and their respective symbols. The equinoxes are at 20th March and 23rd September. The circle closer to the centre is engraved 'CALENDARIVM NOVA 1588'. The other side of the reel is engraved with a table of ruling planets for every hour each day of the week. A protractor, engraved on the horizon line 'HORIZONT RECTVS', and with a scale of degrees divided to ten, subdivided to two, numbered from  to 90 by ten, with 0 at the top is fixed in such a way that it can move along the thread. At the end of the thread is a loop which stops the protractor from being detached from the thread. The inside of the other covering leaf has a table for converting unequal and common hours. Unequal hours are engraved from 1 to 12 twice, and common hours on a surrounding ring, 1 to 12 twice, divided to the half hour. At the centre of the plate is engraved 'ELEVATIO POLI 48', and the horizon line is marked `'HORIZON OBLIQVS'. On a circle surrounding common hours is a scale of degrees, divided in quadrants, divided by ten, subdivided by two, numbered by ten with 90 at the top. Engraved next to the corners are the four elements and temperaments 'AER' ('SANGVINES'), 'AQVA' ('FLEGMATICVS'), 'TERRA' ('MELANCHOLICVS'), 'IGNIS' ('CHOLERICVS'). The spandrel space is decorated with engraved fruits. The eccentric zodiac circle is divided on the edge by ten degrees, subdivided by two, numbered from ten to 30 by ten. The symbols of the zodiacal signs are engraved on the inner part of the zodiac band. A counterchanged alidade is fixed on top of the zodiac band. The outside of the leaf has a sinical quadrant, numbered on the limb from  to 8, divided by 1/2, and similarly numbered on the 45? line. On the limb is a scale of degrees, divided by ten, subdivided by two, numbered from 0 to 90 by ten. On the edge opposite to the centre of the quadrant is a shield with faintly punched decoration. The remaining space is filled with fruit and leaf decoration. The sides of the main box are engraved with fruit and strapwork decoration. Three sides are engraved with a linear scale, numbered from right to left, 1 to 8 on two sides and 1 to 2, 1 to 4 on the other. The scales from 1 to 8 are divided into two then into four parts, and the third scale is divided into two then into eight parts. On the same sides of the main box are engraved fractions, 1/4 and 1/2 for the first two scales, and 1/8 for the finely divided scale. Two simple catches on the sides of the main box keep the instrument open when in use. A similar instrument by Volckmer was sold by Sotheby's on September 30, 1997 (lot 26). The instrument was purchased in 1886 and is described in F. A. B. Ward, A Catalogue of European Scientific Instruments in the Department of Medieval and Later Antiquities of the British Museum (London, 1981), p. 123, no.355.